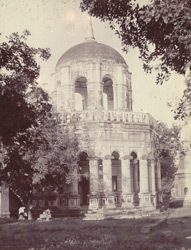 Photograph of the tomb of the Dutch Governor Baron Adriaan van Reede at Surat in Gujarat from the 'Album of architectural and topographical views, mostly in South Asia' taken by an unknown photographer in 1895. Surat was an important Mughal trading port. The English, Dutch, Portuguese and French were permitted to trade here in the seventeenth century. Adriaan van Reede tot Drakenstein (1636-1691) wrote a work on plant species called the "Hortus Malabaricus" which was published in 12 volumes in Amsterdam from 1686-1703. Van Reede, who was the son of a Dutch forester, enlisted the help of the local community of tree-tappers and ayurvedic medical practioners who had specific knowledge of plant species. This view of his tomb in the Dutch Cemetery shows an double cupola with open arcades. On ground level, the arcade is supported by columns.